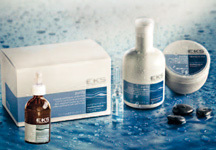 EKS SURGIVAMARINE is a line of products EKS that exploits the properties of the sea to meet the desire of healthy hair, at home and in the salon. 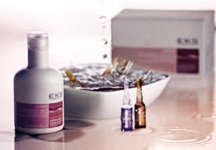 Each formulation has to base an exclusive and innovative acts on the life cycle of the hair, the Aquamaris Complex: a concentrate of seaweed, spring water and marine trace elements that nourishes the hair and provides a reserve of energy is always available. It flows off the French island of Noirmoutier at a constant temperature of 14 ° that allows the microorganisms and algae to live. 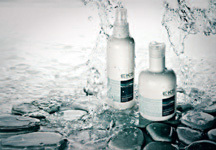 Organisms from simple and complete life cycle : fortify hair and give them a reserve of energy and nutrients. 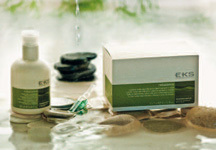 Complex of trace elements (zinc, copper, iron and silicon) and oligopeptides selected from the pure waters and pristine. • PREPARE. Deep cleaning through the application of a product with a particular massage that prepares the scalp to best absorb the active ingredients of the treatment. • TREAT. 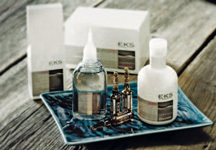 In this phase the hair is nourished, hydrated and treated in a specific way on the basis of the needs that arise. SURGIVAMARINE thus responds in a comprehensive way to a desire for beauty that becomes light, lightness, freshness, energy, resilience, strength, softness, volume.